Ideas for columns come to me in many ways and this one was one I will remember. The Citrus Revolution. One of their signature songs was called Get Juiced and it just so happens that Kaz and Jacqueline Murphy, who own Fully Loaded Juicery, are also neighbors of mine. They heard the music of Citrus playing and were drawn over to the house where they enjoyed a couple sets of music with us. Conversation followed and here we are. I’ve become a huge fan of their cold-pressed juices and wanted to learn more about them and Fully Loaded. I spoke with Kaz Murphy all about the juicery. You have had an interesting career in the entertainment world prior to opening Fully Loaded. I grew up in a very musical family and I’ve spent a lot of my life writing and making music. My wife, Jacqueline, who is also my partner in Fully Loaded, plays violin and accordion, so we’ve done a lot of performing together also. These days I do some writing for television and independent artists, and plan on releasing a CD of my own material by the end of the summer. My next gig is June 26 at the Summer Fun on the 101 Music Festival on the stage right in front of our shop. Easy gig. How did Fully Loaded come to be? Many years back the opportunity arose for me to be a life coach for people with Parkinson’s and paranoid schizophrenics. I would be in out of hospitals with these folks and couldn’t believe the unhealthy food and beverages that they would be served. Being avid juicers since the mid-‘80s, Jacque and I started making recipes for my clients and we found them to be helpful on many levels. About four years ago, we bought a Norwalk cold-pressed juice machine and that changed everything. Our friends started to tell us that our recipes not only made them feel amazing, but that they were delicious, so we decided to try them out at the Leucadia Farmers Market. Before long we couldn’t produce enough juice in one day to last through one farmers market. That’s when we decided to open up a shop and here we are. What exactly is a micro-juicery? We call it a micro-juicery, because like a true microbrewery, you can only get that particular recipe in our shop. You can’t go to Jimbo’s or Seaside and find it. You will never find our juices on store shelves because we will never pasteurize or HPP and that is the only legal way to get your juice on a store shelf. Our juice has a three- to four-day shelf life. How does your process of juicing differ from others and what other differentiators are there at Fully Loaded? Our juice is cold-pressed. When you cold press, the temperature of the produce stays cool so that the enzymes and nutrients stay intact. Our juice machine has 21,000 pounds of hydraulic pressure and after pressing, the pulp is almost as dry as sawdust. We get every possible bit of value out of that pulp. We get three to four pounds of produce in a 16-ounce bottle and there is no pulp in the juice so that the juice absorbs through your stomach lining rather than taking a longer time to go through your entire digestive tract. That way, the valuable health benefits get into your blood stream quicker while everything is still alive and active, and is therefore the healthiest way to drink juice. The juice recipes are literally fully loaded with vitamins, minerals, phytonutrients and enzymes. We work closely with local farmers so that some days the produce is picked in the field that morning and in our juice by noon. I counted 10 different juices at Fully Loaded. What are some of your favorites? At Fully Loaded we usually have between 22 and25 recipes at all times. We are seasonal so that four times a year we take a few recipes off the menu and add a few new ones using produce that is in season. Some of my favorites in the green world of juice are Green Mountain, which features dandelion greens and fennel; Shangri La, which infuses grapefruit and pear in a luscious green mixture; and our signature recipe, the Fully Loaded featuring carrots, E-3 Live (blue/green algae from Klamath Lake Oregon) and just a touch of cayenne in a classic green recipe. And finally, let’s not forget the 4-ounce Dragon’s Breath Tonic, ginger, lemon, turmeric and cayenne. Try this one first thing in the morning and your day will get off to an amazing start. You also have a cleanse program. How does that work? We offer a cleanse program that goes from 1 Day to 21 Days. The cleanses are based on our tried and true 3 Day cleanse, which is really quite easy to do and the benefits that it provides customers is undeniable. 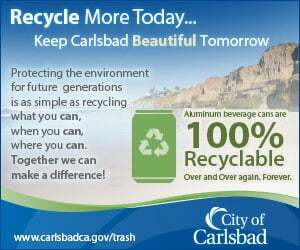 Your location right on Coast Highway 101 is in the heart of Leucadia. I’m thinking that works well for Fully Loaded? We love our location between Lou’s Records and the Pannikin. The neighborhood is very health-oriented and we learn a lot from our customers. Our clientele ranges from surfers to bicyclists, to naturopaths and yoga teachers, healthy older folks, daring younger folks and all in between. 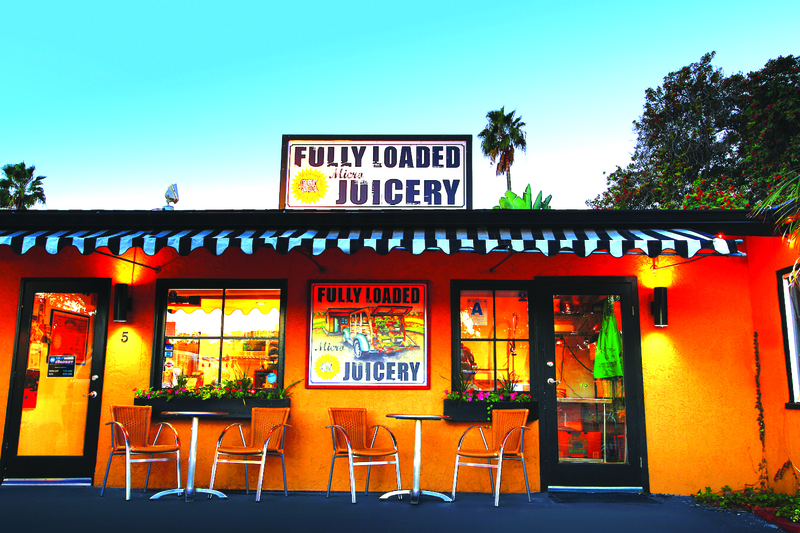 Fully Loaded is located at 466 N. Coast Hwy 101 in Leucadia. Find them online at fullyloadedjuice.com.